Rich Mays, Aaron Sowd, Chris Batista and Cam Smith Robin #122 and 173 Page Original Art Group of 2 (DC, 2004-08). Robin throws some magic into the works in page 4 from "Bad to the Bone" (Robin #122), and makes quite a splashy entrance in this detailed page from "Girl Trouble" (Robin #173). 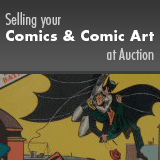 Each page has an image area of 10" x 15" and they are both in Excellent condition. Artwork From the David S. Wyman Institute for Holocaust Studies to Support the Dina Babbitt Campaign.